Roger Federer has often won matches that seemed lost. Two days ago, he lost a match that seemed won. He later came across as oddly complacent about the game, saying his opponent Jo-Wilfried Tsonga had played too well. It's a sign he's losing the edge. Which is OK, you're entitled to lose your edge after winning 16 grand slams and holding the number one spot for some 300 weeks. What dismayed me was Federer's lack of tactical insight. It's clear to even a cursory observer that Tsonga has an iffy backhand. For some reason, Roger refused to focus on attacking his opponent's weakness. It's like he believes his opponent's playing style is irrelevant, that he can win on the basis of his own talent. Rafael Nadal is different, cannier in approach. He attacks Federer's backhand relentlessly on clay with deep, viciously kicking topspin. He can probably defeat Federer on clay even without adopting this strategy, but he keeps to what is tried and tested. Yesterday, with the Haye-Klitschko fight approaching, I watched a few older bouts on YouTube. I started with Klitscko-Lennox Lewis, but it was so boring I needed the energy boost of a few Golden Age matches. I viewed Foreman's demolition of Frazier and Norton; and then the Rumble in the Jungle for about the tenth time. Ali was commentating on the Frazier -Foreman fight, and Frazier on the Ali- Foreman fight. Their approach was strikingly different. Ali kept stressing Frazier should not go ahead like a bull against Foreman's fearsome punches. "He should back up", he said repeatedly. Frazier didn't back up, and got clobbered. Frazier, on the other hand, had no tactical advice for Ali, which was fine because Ali didn't need any. 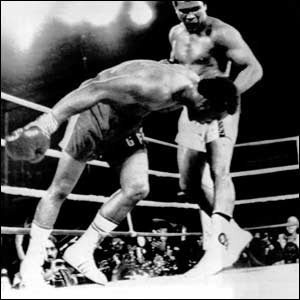 He played his opponent like a master, taking every advantage of Foreman's amateurish technique to launch stinging attacks, while evading his clubbing blows by leaning back against the ring's loose ropes. Ali had a famously big mouth, but he knew his limitations pretty well (at least until he came back from retirement twice too often). He never ever tried to go toe-to-toe with a superior puncher. In that sense, he was a more humble sportsman than Roger Federer.